Get in a workout at our Thomas Albert hotel fitness center. Open 24 hours Free to all hotel guests without any limitations. The fitness center offers a variety of exercise machines and free weights suiting all your cardio and strength training needs. The music is pumping and television is available for entertainment. Towels and water cooler are provided. Whether you’re seeking to stay in shape or you just want to burn off some steam, our Thomas Albert hotel health club has something for you. The fitness center offers a variety of exercise machines and free weights suiting all your cardio and strength training needs. The music is pumping and television is available for entertainment. Towels and water cooler are provided. 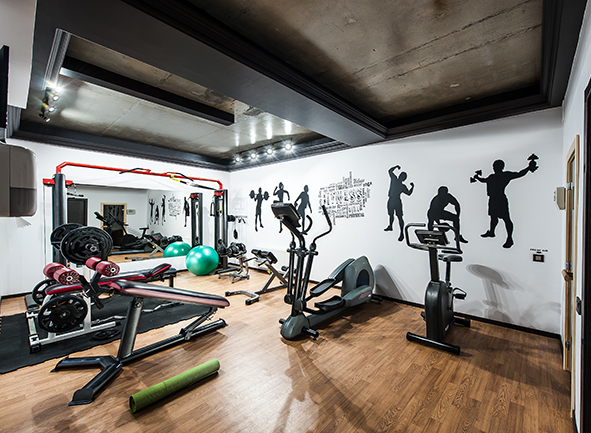 The fitness center is open 24 hours a day and is free to hotel guests. Use your room key for access.